The Unbundling of Finance is talked about, it is info graphed, and it is happening left and right. Private markets maybe very small in size compared to public markets, but they are increasingly attracting interest and the audience with a “watchlist” in private equity, private debt and real estate is growing. Traditionally, the investors in these asset classes have been HNW, family offices, accredited investors in the US, and Angel investors and Venture Capital firms. We are also seeing more and more direct and indirect involvement of “the crowd” in this space, which boils down to retail investors. They are either individuals who are willing to do the homework needed to generate higher yields or some alpha (expected from such private investments) or indirectly, via financial advisors and robo- advisors who are integrating such private offerings into their platforms. Financial advisors for example, may use NSRInvest for managed accounts of their clients in order to create and manage a portfolio of P2P loans. Robo-advsiors for example, like Hedgeable offer their clients private investment choices through a partnership with CircleUp (US focused on private consumer products). Traditional financial institutions have already begun to partner with the “undbunled Fintech” companies in the private market space, opening up their distribution network to the alternative finance Fintech companies. Few examples of such partnerships are: MyMicroInvest, a crowdfunding platform in Belguim, has partnered with BNP Paribas Fortis in Belgium, so that the incumbent’s clients have direct access to the alternative financing platform. MarketInvoice, an online invoice finance platform has partnered with KPMG, so that their small business clients can have direct access to the MarketInvoice platform, should they require working capital. Alternative financing, which includes crowdfunding and is focused in private markets, is not yet mainstream. When we all have apps for our private equity/debt/real estate watchlists, trading, and risk management on our smartphones, then it will have become mainstream. Steps are taken every day towards that direction. Equity crowdfunding is less developed than debt and real estate crowdfunding. All these subsectors will continue to develop and geographic structural needs will dictate the pace of growth in each region. 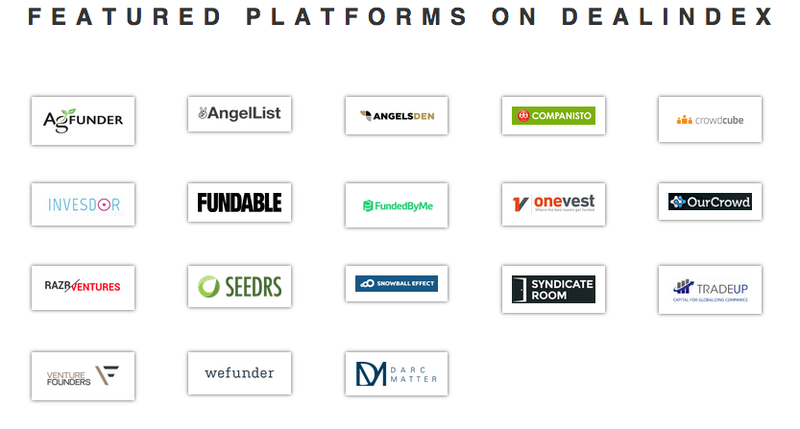 DealIndex is a crowd funding aggregator that has launched its platform by concentrating more in the equity crowdfunding space and is slowly expanding into debt, reward/donation, and real estate. They screen alternative financing platforms and make selections based on quality. They provide real time and historic data on company deals (some of their functionalities are graphic). They include mainly data, valuations, analysis tools and some research. Research is in-house and they aim to provide more analysis than the crowdfunding platforms showcasing the deals. DealIndex users have the flexibility to filter their watch lists by business sector, by geographic region, by platform and or by funding instrument. Their dashboard has a blog and in house research, including regular (expected to be) thorough overview white papers on the industry developments globally (Democratizing Finance, DealIndex Research, July 2015). Insights are summarized from across the globe, from their NY presence and their Asian presence. DealIndex reaches out to their extensive network Grow VC and leverages the experience in creating marketplaces and Fintech technology implementation of the “mother” company, to source offline deals and offer extra value in evaluating online deals, while respecting the privacy and time-sensitive issues around such deals. Neha Manaktala, CEO and co-founder of DealIndex, wants the platform to be the next generation of FactSet that investment banking professionals use. She also wants to contribute to expanding the audience of private alternative financing investments and to alter the way such deals are marketed. The paradigm shift that is part of the big trend of Unbundling of Finance, is happening. VCs, Angel investors will collaborate with crowdfunding platforms. Hedge funds already are getting more involved in hybrid model allocations by increasing their private market holdings. And the re-bundling of all these alternative financial services is shyly starting to happen. Daily Fintech Advisers (the commercial arm of this open source research site) can help implement strategies related to the topics written about here. Contact us to start a conversation about creating marketplaces and re-bundling innovative financial services. Next Survey: the boom in Accelerators is sign of bubble or a new form of post corporate work?